While the big imperialist conflict, that the global and regional superpowers are waging for several years in Iraq and Syria (2) through their local proxies, is currently entering a state of temporary limbo, while the bourgeois factions and the armies and the militias serving their interests are licking their wounds, preparing and arming for the next round of carnage of the proletarian cannon fodder and their politicians and media are busy re-interpreting it as an image of victory, in order to sell it to “their citizens”, and reaffirm and fasten the leashes that bind our class to the democratic spectacle, the proletariat in the region is starting to raise its head again. Like any proletarian movement, this revolt didn’t just appear from nowhere, but it is an expression of months of anger and intensifying struggle against the living conditions in Capitalism. (5) Just like its Kurdish counterpart, the Iranian State’s involvement in the capitalist war in Iraq and Syria is starting to cripple its ability to appease the proletariat by throwing it breadcrumbs from the bourgeois table. This entanglement of the interests of the “Revolutionary Guards” represents a very explicit expression (it may appear more subtle or hidden in other cases, but it’s still there) of the fundamental role of the cycle of war and peace for the modus operandi of global Capital. On the one hand, both war itself and the subsequent scramble for reconstruction and investment in the peaceful period are nothing else than a concrete form of competition between capitalist factions. It is nothing else than the expression of the underlying need of the various factions of global Capital to expand their market in order to make for the decreasing rate of profit. At the same time, war serves a purpose to divide the class into categories along the national, regional, religious, political, etc. lines in order to suppress the class struggle and break the international solidarity of the proletariat. This is exactly what happened in Syria in 2011, when the local expression of the proletarian uprising against the misery of live in capitalist society and the State terror that swept the countries of Maghreb and Mashreq and beyond (labelled as “Arab Spring” by the bourgeois media in order to disguise its class character and prevent the solidarity from the proletariat in “non-Arab countries”), had been co-opted and channelled into the bloody inter-bourgeois war, by concerted effort of Assad’s regime, bourgeois-military leadership imposed on the FSA militants (6) and various foreign sponsors. Ultimately war serves as a mean to physically dispose of the redundant labour force, which is very relevant for the capitalist faction of the region with a huge unemployment, and in the near future will become more and more relevant globally. As the protests spread more and more to include Tabriz, Qom, Isfahan, Rasht, Ahvaz, Sari, Zahedan, Qazvin as well as many smaller provincial cities and towns, their confrontational nature and the practical critique of property, commodity, misery of life in the capitalist society becomes more prominent. The administrative buildings of many public institutions, including the offices of the mullahs, police stations and Basij militia headquarters were burned to the ground. Looting of shops is widespread. In some cases, like in Kadharidzhan, groups of militant proles attacked the police station with the goal to loot the weapon cache and arm themselves for the continuation of the struggle! And indeed, on several occasions (in Nadzafabad in Central Provinces), the cops, the “Revolutionary Guards” and Basij militia members, besides being pelted with stones and Molotov cocktails like everywhere, were also been shot at with guns. (7) Other favourite targets are the banks (both those owned by the military-industrial conglomerate of the “Revolutionary Guards” and those owned by their multinational mothers). South Pars Oil and Gas workers went on strike over unpaid wages, as did workers in Tabriz tractor factory, bus drivers in Tehran, teachers, factory drivers and farm workers. One of these radical minorities are definitely the revolting students in Tehran University, formulating also fundamental class positions against the attempts of the bourgeoisie and the various iterations of the historical Social Democracy (“Islamist” or “secular”) to divide the struggling proletariat along the gender lines, as well as along the lines of bourgeois political currents of “moderate” or “fundamentalist” politicians; and for the class associations outside and against the Social Democratic structures in the form of Shoras (worker’s councils). (8) Our class enemy has very well understood the leading programatical role that these comrades play in the movement and the State repressive forces are targeting them with an extraordinary ferocity. This is in fact a fundamental and indivisible characteristic of the class struggle waged by the ruling class – the bourgeoisie – against our class. Enforcing and reproducing the false separations in our class along the lines of the factions of bourgeois interests expressed politically by myriads of categories (nation, race, gender, sexuality, religion, local patriotism, economic sector, political party, etc.) (10) is its central and only feasible strategy as unified global proletariat, that tends towards organizing itself in an autonomous and centralized way for its own class interests, is its mortal enemy and the harbinger of doom for the whole capitalist system. # Uncompromising revolutionary defeatist positions, clearly anti-posing the needs of the national factions of Capital to fight each other in the inherent cycle of competition for the market to realize the exchange value of their commodities, for the natural resources and for the imposition of its particular economic and political model of exploitation, as well as the needs of global Capital to keep our class divided in order to counter our proletarian interests to fight against our exploitation and miserable living conditions. # Affirmation of the necessity to prepare and organize the violent uprising against Capital and its State including obtaining weapons, attacking key points of the State infrastructure, demoralizing the forces of repression. # Attack on bourgeois morality that keeps our class atomized as obedient workers, church or mosque goers, wives and husbands, soldiers, voters. #	The capitalistic economy is in crisis, may it die! #	The enemy is capitalism and the dictatorship of world market! #	The objective is everywhere the same: social revolution! #	Destruction of capitalism and the State! 2. Or rather should we say the regional expression of its openly militaristic face, with others, less intensive for the moment, “theatres” being Ukraine, Yemen and soon possibly South China Sea. 3. Government parties Kurdistan Democratic Party (KDP) and Patriotic Union of Kurdistan (PUK) as well as opposition parties Gorran and Kurdistan Islamic Union. 4. Similar causes fuel also the class struggle in Tunisia, where months of street protests and worker’s strikes against the lack of jobs, rising prices of food, gasoline and cuts in social benefits are culminating into yet another wave of widespread riots – the “proletarian celebration” of the 2011 uprising anniversary – biggest since May of 2017 (when police stations and oil and gas pumping stations of ENI, OMV and Perenco burned like candles). The protests scared the ruling class into quickly backpedalling and announcing new form of the social benefits and State guaranteed mortgages, while simultaneously cracking down on the protesters and arresting hundreds. 6. As a distant echo to the process of militarization of the “Red Guards” during the Revolution in Russia in 1917 or of the “workers militias” in Spain in 1936 (for taking only two known and revealing historical examples), the different “liwas” (brigades) and “katibas” (battalions) that emerged in the revolutionary dynamics in Syria as from 2011 expressed and materialized at a given moment the contradictions of the current social movement. Created by and initially constituted of “deserter soldiers” and “civil proletarians” to protect the movement from the terror exerted by government repressive forces, these grassroots organizations and other armed militias (not very clear as for their political and social program, just as the “Red Guards” and “workers’ militias” were not clear in their time) will be framed by political forces of the bourgeois opposition while therefore being known under the generic name of the “Free Syrian Army”, and will rapidly and inevitably transform themselves into armies serving different factions of the bourgeoisie through their own weaknesses and lack of rupture on one hand, and through deceit, violence and nationalist and Islamist propaganda on the other hand. 7. Unfortunately, we have to say that the capitalist forces of repression are having the upper hand and they are doing all things possible to once again drown the class movement in blood. At least one hundred (by the time of writing) of our class brothers and sisters had been massacred by them with thousands seriously injured or arrested. 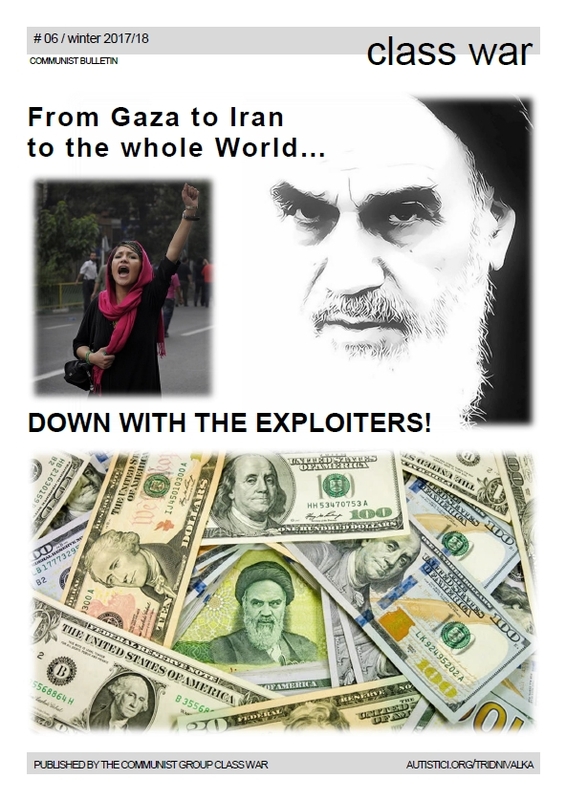 We would like to appeal to our comrades all around the world and in the region neighbouring Iran in particular, to express the class solidarity with these militants also practically, to shelter and hide them from the State terror, to help them to re-group, to demand their release from prison, to directly attack the representatives of Iranian faction of the global bourgeoisie and its interests (along with their “own” bourgeoisie of course). 8. Let’s remind that neither workers’ councils nor soviets or any other form of proletarian organization is in itself a guarantee of the content of the revolution. 9. Other Social Democratic false friends of the class vomited their statements of “support” of the movement including Daesh, PYD/PKK (and their militias) and of course MEK. All of them have been showing for many years that they are experts in extinguishing by embracing any spark of class anger they can lay their hands on and turning the struggling proletarians into their supporters and cannon-fodder in the inter-bourgeois bloodshed. 10. We salute all our class brothers and sisters in Iran, who spitted in the face of Mullahs and their cops, flavoured by the deadly fairy tales of Islam, version of the capitalist morality, with rules like separation of sexes in public or stupid dress codes forcing the women to wear some kind of rag on their head. But even more, we salute those of the proletarian women, who in the act of the practical detournement turned those rags into weapon against the State, as makeshift balaclavas, slingshots, etc. Since the major uprising in Iran at the end of last year, people across the country have continued to protest. There is currently a protest being held by traders at the Grand Bazaar in Tehran. The traders are angry about the plummeting value of the rial, the country's currency, and the rising prices. The shops at the Grand Bazaar were closed and thousands of people took to the streets. As the protesters made their way towards parliament, the suppressive forces and riot police used tear gas in an attempt to disperse the crowds. It is being described as the biggest protest in the city since 2012. In 2012, the people took to the streets to protest against the government’s response to international sanctions that were having a devastating effect on the economy. It was these protests that pushed the government to agree to nuclear talks and eventually the nuclear agreement. The current protests in Iran have received widespread support from the Iranian people and the protests have spread across the city. Furthermore, protests have broken out in other parts of the country including Shiraz, Kashan, Shahriar, Karaj, Bandar Qeshm, Kermanshah, Mashhad and Bandar Abbas. In Bandar Abbas, demonstrations turned into a clash. The brave people of Iran are risking injury, arrest, torture, imprisonment and even execution to take to the streets to make their voices heard. They know that they are stronger together and they refuse to be silenced by the cruel, corrupt and violent regime that is destroying the country. Iran, Tehran: workers at Tehran Terminal Barracks strike in solidarity with nationwide truckdrivers’ strike now in its 7th day “In solidarity with the strike of truck drivers in 257 cities, on Monday, Tehran Terminal Barracks workers and staffs joined the truck drivers strike with slogans. : Do not be afraid, Do not be afraid, We are all together; They have called on marketers and businessmen in Tehran to join the strike as well. … The clerical regime in fear of a united and powerful nationwide truckers strike in Sanandaj sent in a hurry his special forces to the gathering of protesters. In the city of Kangavar (in the province of Kermanshah), also the clerical regime has sent its agents and has deceived truck drivers that the strike is over. But vigilant drivers did not believe in the deception of the regime and continued their strike. Following the drivers and truckers strike, there were long lines at gas stations in the city of Sardasht (West Azarbaijan province). The regime’s governor in the city called for people’s calm in a statement in panic about the formation of protests and falsely declared that there is no gas shortage in fuel stations. Also on the sixth day of truckers strike, oil tankers from the Sanandaj Oil Company (West Iran) expanded their empty food spread to protest lack of their livelihood. The clerical regime sent its law enforcement officers to the site, in fear of spreading this move to general public. The drivers of oil tankers in Kerman also stopped working. Following the strike of truckers, fresh vegetable whole seller market in Kerman was closed as well. Iranian drivers in Georgia, in a symbolic act, in solidarity with the striking of Iranian truckers also refused to load their trucks.” See also entries for 27/5 & 26/5/18. Thanks for the updates, Blesk.